The studio opened its doors June 21, 2011, on the summer solstice, and it is the first yoga studio in Halifax County, North Carolina. The word solstice, translated from Latin, means standing still in the sun. Yoga helps the practitioner to become still, balanced and integrated. And yoga is for everyone. Our goal at the studio is to offer classes that revitalize your body, calm your mind and inspire you to become the best you. Yoga can show you the way to good health, re-balance your energy and restore your peace of mind. Classes at the studio are based on Hatha Yoga and you can be certain these classes will build your flexibility, strength and endurance, so raise your vibration and join us for a free class (for first-time students). Questions? Scroll down this page for information on the SCHEDULE (click the Schedule link below). 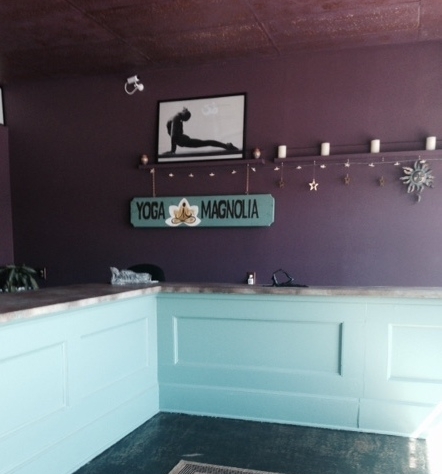 Or you can give us a call at 252-445-1031; you can also email yogamagnolia@yahoo.com. We are located in downtown Enfield, at 125 North Railroad Street; a sleepy, rural town where you won’t have trouble finding a parking space. Our classes are small, so you get plenty of individual attention. And everything can be modified to meet your needs. Ready to take some classes? Just drop by the studio for your first class - it's free!